Angel Martinez, a 17-year-old Auburn High School senior, is a national champion in boxing with more than 100 victories. His coach, Jimmy Goodwin Jr., trains him at Patriots Boxing Club on Seventh Street in Rockford’s Midtown District. Tucked within a storefront on Seventh Street in Rockford’s Midtown District sits the Patriots Boxing Club. The sounds of muscular teenagers pounding away on punching bags echo throughout the gym. The buzzing of the ringer sounds every few minutes, signaling the time for two more boxers to step into the ring to begin another sparring session. This is a gym where teenagers improve their boxing skills, but it’s also a place that can shape many of their lives. The overseer of this facility is Jimmy Goodman Jr., a full-time teacher at Flinn Middle School, who volunteers as the club’s boxing coach. Goodman is no stranger to the world of boxing. In the early 1980s, his father, Jim Goodman Sr., coached at the Lincoln Park Boys Club and the Downtown Boys Club. Young Goodman spent hours with his dad in the gym, watching the likes of former Rockford great Kenny Gould train. And he has. Needing to find a centralized location, the Patriots Boxing Club eventually moved to a garage on the corner of Fifth Street and Seventh Avenue, in Rockford. Needing more space, the gym moved seven years ago to its current location on Seventh Street, in the former Rockford Mattress building. It’s not ideal, but it’s the best Goodman can do for now. On many days, there are 50 or more kids packed into the cramped gym, fighting for workout space. Goodman dreams of opening a bigger facility, but that will take much-needed funds. “We’re making this work,” says Goodman, who also serves as vice president of the Illinois Amateur Boxing Association. The future of the club may rest in the strong hands of Goodman’s prized student, Angel Martinez. The 17-year-old Auburn High School senior has been boxing since he was a skinny 10-year-old. And he’s good. 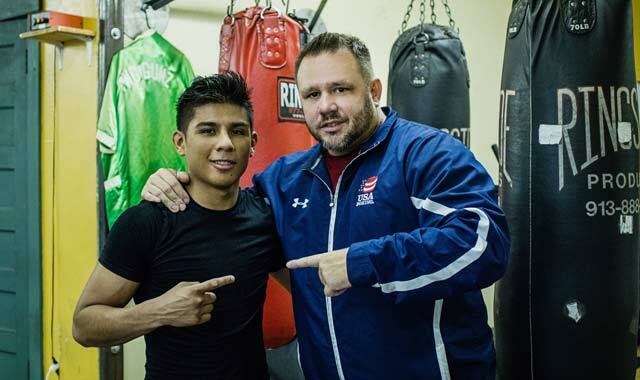 Check out his resume – he’s a national champion, has more than 100 victories, has defeated boxers twice his age, and is training in hopes of boxing in the 2020 Olympics in Tokyo. When he graduates from high school in the spring, Martinez plans on staying close to home to attend college. He plans on becoming a nurse once his boxing days are over. Goodman knows what boxing means to many of the kids who train in his gym, many of whom come from broken homes. As for Martinez, he’s busy training for the U.S. Nationals Trials, which will be held in Utah later in December. He will find out in 2019 if he qualifies for the Olympics. His coach likes Martinez’s chances. On most days, after the grueling practices come to a close, Goodman huddles his boxers together for a long pep talk. They typically talk about boxing strategy, but mostly the conversation centers around life lessons. At 38, Goodman has spent most of his life around the sport of boxing. A single man, Goodman has a girlfriend, but his students are also like family. This entry was posted on Monday, December 4th, 2017 at 11:54 am	and is filed under Features, Top Posts. You can follow any responses to this entry through the RSS 2.0 feed. Both comments and pings are currently closed.